With EastComfort you can book the right apartment in Bucharest. Our Bucharest apartments are suitable for business and leisure. Try sorting the apartments below by number of guests, price or our recommendations. Bvd.Magheru, RENTED FOR LONG TERM!!! One important thing when renting short term apartments is the location, this apartment is located in one of the most important blvd. of Bucharest. 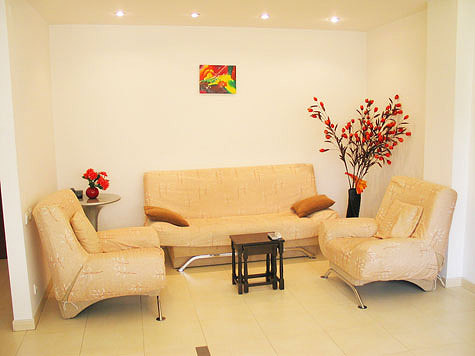 The apartment is suitable for couples and travelers, but also for a business rentals. It comprises a bedroom, living room with kitchen and bathroom. Due to the large windows you have a beautiful view to Magheru Boulevard and to the center of Bucharest. The elegant and modern furniture of the apartment and the light colors used to decorate offers the sensation of comfort and space. In the living room the light colors are associated with the elegant black and silver of the open kitchen. In the kitchen you will find everything necessary to cook (gas cooker, coffee maker, toaster, refrigerator, cooking utensils). 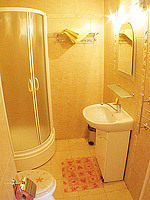 In the bathroom (fitted with shower cabin) are used the same light colors as the rest of the apartment. All amenities in this central area of Bucharest: pubs, posh restaurnts, loudy clubs or discos, secure banks or commercial centers of Bucharest.